The convenience and security of Box meets the productivity of Office 365. Whether you are on a desktop, iPad or iPhone you can create and edit Word, Excel and PowerPoint files stored in Box. With the recent addition of Office 365 to Baylor's suite of available software, you are now able to edit Office documents stored in Box using the online versions of Word, Excel and Powerpoint. Click here to learn how this powerful, new integration works. If you do not wish edit Office documents stored in Box using Microsoft's online versions of its software, install Box Sync and Box Edit for either Windows or Mac systems using the Download links located at www.box.com/box-for-devices. Once these applications are installed, you will be able to manage the items in your Box account from your desktop and you will be able to open Microsoft Office files stored with Box from your desktop system. Install the Box app for iOS or Android from either the Apple App Store or Google Play. We hope that you enjoy the convenience and security of creating, accessing and editing your Office documents on your desktop or mobile devices. 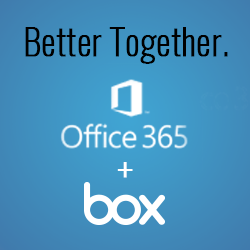 Box and Office 365 work better together to support your academic success.